Gas hydrates are an ice-like storehouse of the greenhouse gas methane found in continental margins of the world ocean. Warming waters can cause hydrates to decompose and release ancient methane to overlying sediment and waters. The continental shelves of the Arctic Ocean have been thought of as “ground zero” for the potential release of methane from hydrates, since the Arctic is warming rapidly and hydrates are found at relatively shallow water depths there. 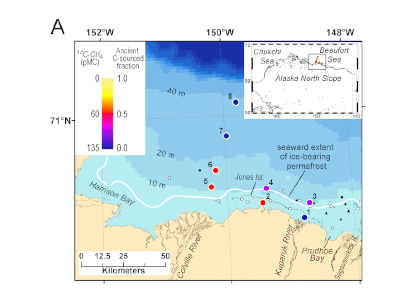 Another potential ancient methane input to Arctic shelf waters is the methane produced by microorganisms from the gradual thawing of permafrost carbon within seafloor sediment and/or transported to the shelf from terrestrial permafrost via rivers. But, can large stores of ancient-sourced methane reach surface waters and enter the atmosphere, contributing to greenhouse warming? Figure caption: Map showing the fraction of methane in each surface water sample that was derived from ancient hydrate or permafrost, on a scale from 0 (modern, 0% ancient; indigo) to 1 (100% ancient; yellow). While some of the near-shore surface methane samples have a significant (~50%) ancient component, in waters deeper than 20 m, the surface water methane was mostly (90-95%) derived from modern sources. 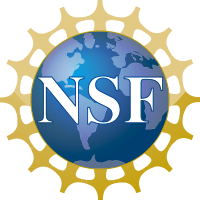 To answer this question and understand the role of these ancient sources of methane (hydrates and permafrost), the authors of a 2018 study in Science Advances measured the natural abundance of radiocarbon (14C) in dissolved methane in the shallow shelf waters of the Alaskan Arctic Ocean (U.S. Beaufort Sea); methane derived from ancient sources has little to no measurable 14C because of radioactive decay over time. The 14C-methane results show that ancient sources are contributing methane to the study area’s waters, as the authors predicted. However, ancient methane emitted to seawater can be consumed by microorganisms or transported away by currents before reaching the atmosphere, though these mechanisms have not been known to be effective at removing methane in waters <100 m. This study revealed that these removal processes are surprisingly efficient in shallow shelf waters, especially at the study area’s deepest stations of 30 and 40 m depth, where only ~10% of the methane in surface waters was derived from ancient sources. These results add to a growing body of evidence against the likelihood of a large methane emission to the atmosphere occurring from ancient sources like hydrates, since the authors expect that methane removal processes in the water column are much more efficient in waters 100s of meters deep, where the bulk of the hydrate reservoir resides. A recent study by Pohlman et al. published in PNAS showed that ocean waters near the surface of the Arctic Ocean absorbed 2,000 times more carbon dioxide (CO2) from the atmosphere than the amount of methane released into the atmosphere from the same waters. The study was conducted near Norway’s Svalbard Islands, which overly numerous seafloor methane seeps. Methane is a more potent greenhouse gas than CO2, but the removal of CO2 from the atmosphere where the study was conducted more than offset the potential warming effect of the observed methane emissions. During the study, scientists continuously measured the concentrations of methane and CO2 in near-surface waters and in the air just above the ocean surface. 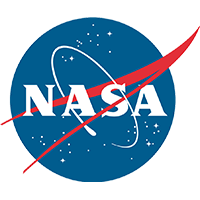 The measurements were taken over methane seeps fields at water depths ranging from 260 to 8530 feet (80 to 2600 meters). Figure 1. 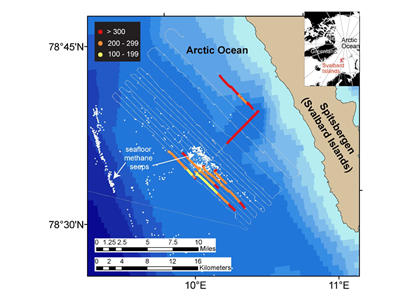 Ocean waters overlying shallow-water methane seeps (white dots) offshore from the Svalbard Islands absorb substantially more atmospheric carbon dioxide than the methane that they emit to the atmosphere. Colors indicate the strength of the negative greenhouse warming potential associated with carbon dioxide influx to these surface waters relative to the positive greenhouse warming potential associated with the methane emissions. Gray shiptracks have background values for the relative greenhouse warming potential. Analysis of the data confirmed that methane was entering the atmosphere above the shallowest (water depth of 260-295 feet or 80-90 meters) Svalbard margin seeps. The data also showed that significant amounts of CO2 were being absorbed by the waters near the ocean surface, and that the cooling effect resulting from CO2 uptake is up to 230 times greater than the warming effect expected from the methane emitted. Most previous studies have focused only on the sea-air flux of methane overlying seafloor seep sites and have not accounted for the drawdown of CO2 that could offset some of the atmospheric warming potential of the methane. Phytoplankton appeared to be more active in the near-surface waters overlying the seafloor methane seeps, which would explain why so much carbon dioxide was being absorbed. 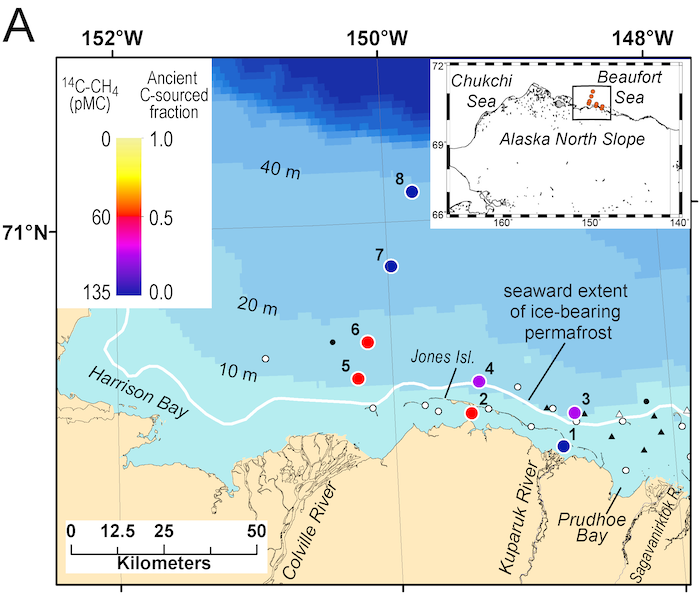 Physical and biogeochemical measurements of near-surface waters overlying the seafloor methane seeps showed strong evidence of upwelling of cold, nutrient-rich waters from depth, stimulating phytoplankton activity and increasing CO2 drawdown. This study was the first to document this CO2 drawdown mechanism in a methane source region. 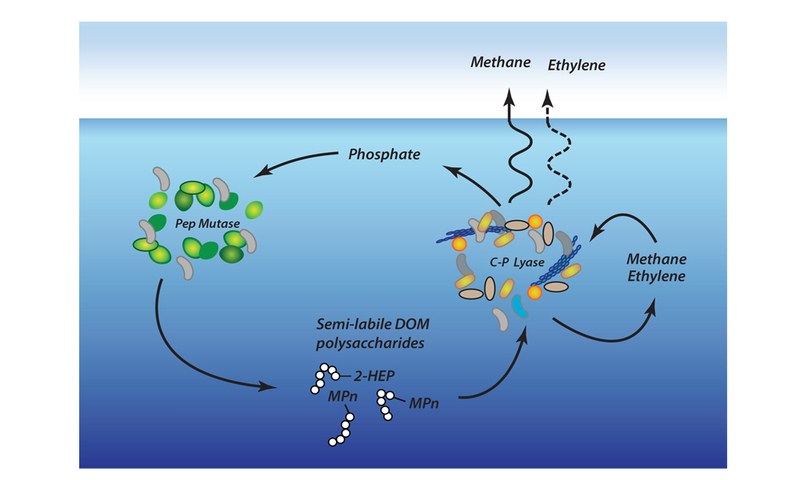 A large fraction of the ocean-to-atmosphere flux of methane occurs in well-oxygenated, open ocean oligotrophic gyres, a phenomenon seemingly at odds with well-known pathways of archaeal methane production under strictly anaerobic conditions. Nearly a decade ago, David Karl and colleagues at the University of Hawaii proposed that water column methane could arise from bacterial metabolism of methylphosphonate, a simple organic compound with reduced phosphorus bonded directly to carbon. However, evidence for this pathway in the environment was lacking. In a recent study published in Nature Geoscience, Repeta et al. (2016) were able to test Karl’s hypothesis using a combination of microbial incubations, genomic analyses, and in-depth chemical analyses of marine dissolved organic matter (DOM). The study revealed that polysaccharides decorated with methyl- and hydroxyethylphosphonate esters are abundant throughout the water column, and that methane and ethylene were quickly produced by natural consortia of bacteria exposed to DOM-amended seawater. Companion knock-out experiments of bacteria isolates further showed that the C-P lyase metabolic pathway was responsible for methane production. Daily cycling of only 0.25% DOM polysaccharide can easily support measured fluxes of marine methane to the atmosphere. Figure from Repeta et al. (2016).